Once you've been setup through X-Charge, contact the TeleTracker Sales Department to have your information updated in the system so that the Merchant Services window can be activated. When completed, the screen should appear as above. The Merchant # and BIN / Bank ID information will be provided by X-Charge. The Credit Card Information Mandatory button box will require that all credit card information is entered when using manual credit card processing. 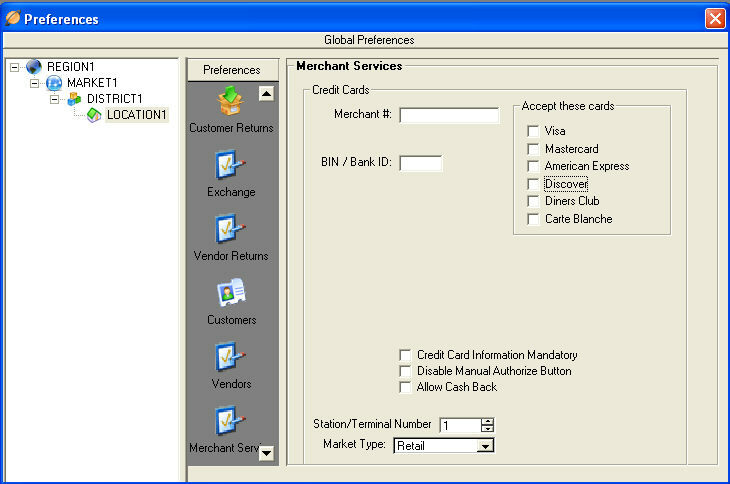 The Disable Manual Authorize Button box will disable the ability to manually process credit card payments. The Allow Cash Back box will determine whether or not you want to authorize cash back on debit transactions. The default setting for Station/Terminal number is 1. If you are using more than one terminal than enter the correct terminal number. Using the drop down box select Retail under Market Type. Place a checkmark next to the cards which are accepted at this location. When you have entered all the necessary information proceed to Workstation Settings.